Most photography enthusiasts today create long time projects featuring a series of images like self portraits, cityscapes or just random shots from their daily activities. Like the concept behind an illustrator’s sketchbook or a writer’s journal, a photo series is a great avenue to showcase not just the artistic medium but the stories behind each captured moment. We oftentimes see amazing captures of natural subjects or portraits in most photo series while some manage to bend their style over the common trend in such projects in photography. One amazing example is David Eger. Photography has been David’s passion as far as he can remember which most probably drive him to become a teacher in Visual Arts and Non Traditional Visual Arts including Photography. Last year, he created something really awesome from the hopes of fulfilling his 2011 New Year’s resolution of making more and more photos. 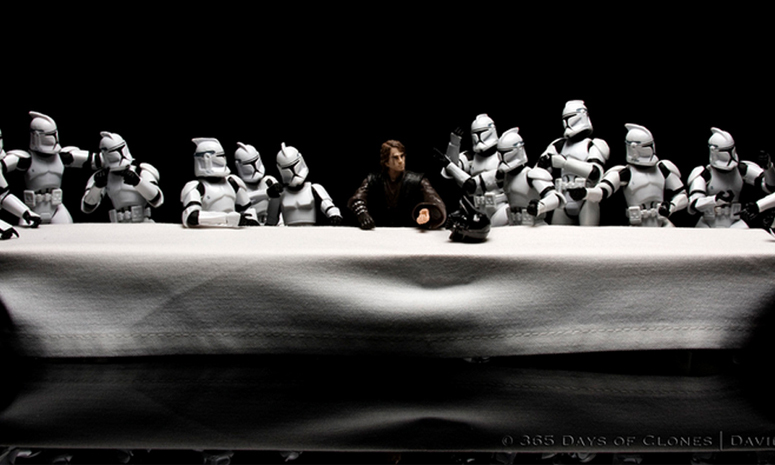 The project is called 365 Days of Clones which eventually became a hit over Flickr. 365 Days of Clones was his daily project last year which is basically taking a photo every single day starring not himself but the Clone Troopers from the popular movie franchise, Star Wars. The project began last January 1, 2011 until December 31, 2011. But because of its rising popularity, he decided to continue the concept which is now an ongoing sets of projects called “52 Weeks of Star Wars“, “Cloned Photos” and the “365 (Alternative) Days of Clones“. The unique thing about it is that each photo is more than just a random idea of photographing inanimate objects. Some photos relate to historical events or images, some relate to what “day” it is and some features the Troopers just fooling around with other characters and objects. And to give you an awesome journey towards the year when Troopers ruled the world in photography, we have collected some of the most iconic images that David created for this amazing projects. Enjoy! NOTE: Images on this page are not owned by YouTheDesigner and are used solely as design examples and inspiration. All images might be subject to copyright by their respective owners. Please click on the images to see their original sources. There you have it guys! Be sure to check out the official website of David Eger’s 360 Days of Clones for more amazing photographs! What’s your most favorite Troopers photo? Tell us your thoughts and suggestions by commenting below. Find us on Facebook, Twitter and Google Plus for more updates, design news and features, or better yet subscribe to our blog for the latest design inspirations, stories and freebies. Stay awesome everyone!